Almeria Hotels Spain, 2, 3, 4 and 5star - Accommodation Almeria - My Reviews! Pick and choose from the following Almeria Hotels, situated in the City of Almeria. I have pre-selected the following ones, taking in mind different preferences my site visitors might have! Those that are missing are either those I do not know enough or those I would not recommend. The following Hotels have one thing in common: They are all located in the center of the city, very close and in walking distance to historical monuments, the port and shops. 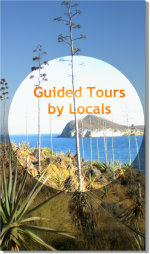 Great locations to stroll around, going out for some tapas, visit museums and monuments! to read my short comment on this particular Hotel, then click on the name of the Hotel to see more details. Located in the historic centre of Almeria city, this trendy and classy Hotel occupies a building of the early nineteenth century, where you may enjoy the ancient tradition of Arab Baths "Aire de Almería", next door! Located in the centre next to historic momuments and in the commercial part of Almeria city. This contemporary Hotel features a roof pool with views to the Alcazaba! Charming Boutique Hotel next to the Cathedral in the heart of Almeria City, located in the historic part at walking distance to shops, restaurants, museums and monuments. Recently re-inaugurated it is located in the centre, at walking distance to all historic momuments, shops and harbour. Its Restaurant is also a popular meeting point for locals! Situated right between the center of Almeria city and the sea promenade. Comfortable rooms and cozy decor! Main train and bus station is right opposite the Hotel! The hotel has a small indoor pool with jacuzzi and sauna area. But if you prefer, there is also a gym at your disposal. Superb Location for city sightseeing. Simple decorated rooms with city views and all necessary amenities. Great value and location! Right in the center of Almeria city. Friendly staff. Twin and Triple rooms available. Perfect for sightseeing on foot!